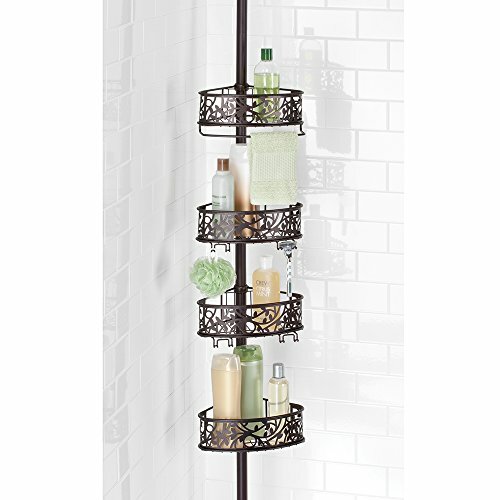 Corner shower caddies come in a wide diversity of shapes and designs. 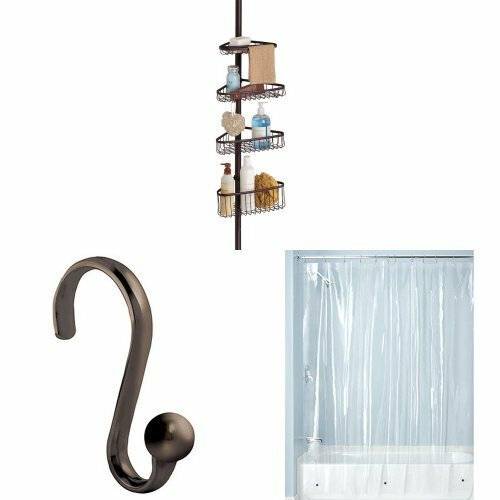 Some of the top features some look for in a corner shower caddy: rust proof, tension pole corner shower caddy, mesh shower caddy and the best shower caddy for college. Some even look for a plastic shower caddy with handle. But no matter what specifics you search for in a corner caddy, you will find it due to the immense variety out there. But when buying shower caddies, first make note of you needs. This includes what you will be putting in your caddies, what you will need to install your caddy and what weight bearing issues need to be considered. Enjoy our curated products. 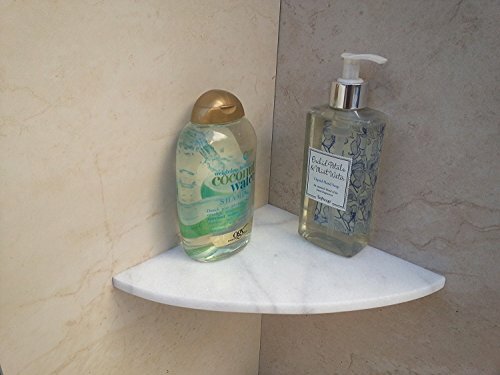 corner shelf marble Size 8″ x 8″ inches dimensions and ” thickness 1 cm aprox. STAYS PUT, YET EASY TO MOVE: Featuring strong, long-lasting suction, our bathroom corner basket storage caddy adheres securely, Yet it’s easy to remove and place in a new spot anytime you want. SHAMPOO CONDITIONER HOLDER: With super holding power, each suction cup holds 44 Pounds: this has impressively strong suction! No need to worry about heavy or wet items crashing down. 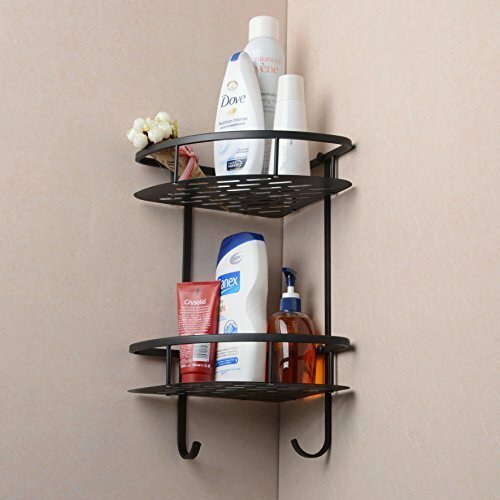 BATHROOM STORAGE: Shelves and hooks for shampoo, conditioner, soap, razors and washcloths. ALL STYLE, NO RUST: Lovely steel baskets with an ornate design and rustproof bronze finish. 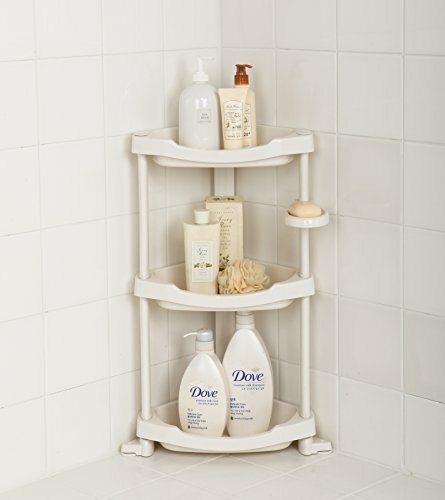 SPACE SAVER: Shower caddy measures 9.75″ x 8.25″ x 10′ (fully extended) – create extra storage. Extendable from 59in. to 102in. 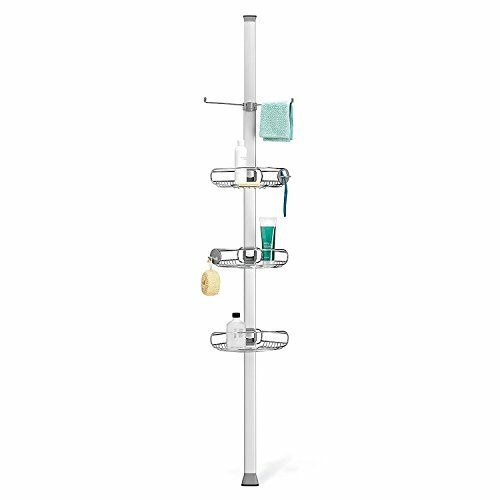 CONVENIENT STORAGE AT ARMS REACH – Using the shelves supported by the Tension Pole means having what you need right at your side so you can actually enjoy your shower or bath. Bathtubs and showerstalls are not equipped to keep your essentials where they won’t tip over, slide around, or spill. 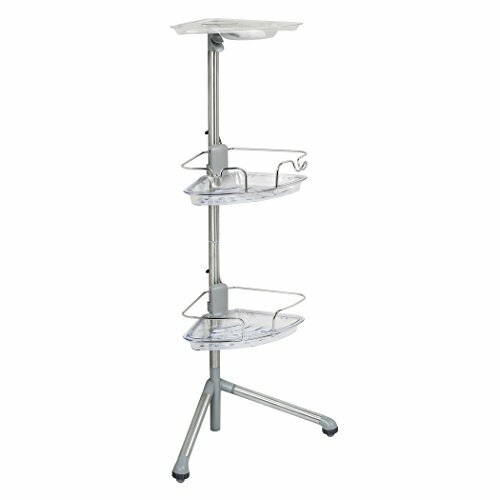 This corner caddy gives you plenty storage without compromising your space or comfort. ITS DURABLE & COMPACT DESIGN – with a stylish chrome finish which is rust resistant. A slide-n-lock mechanism ensures your caddy remains securely in place all the time. 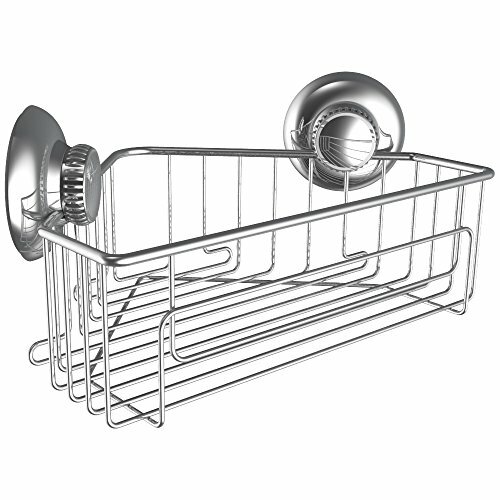 Your bath products dry quickly and easily with this open wire designed caddy. 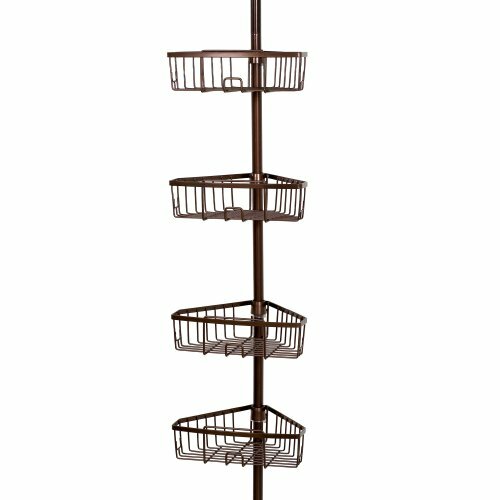 Fits easily in any space up to 8′ 1″ ceiling but will work best in a 69″ space. 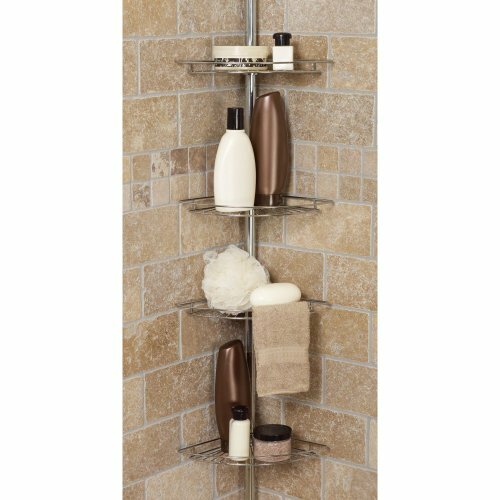 Unit measure 12.2 inches W 9.4 inches D x 108 inches H.
AN ATTRACTIVE FINISH – Providing you with an attractive, modern storage option for your shower or bath space. 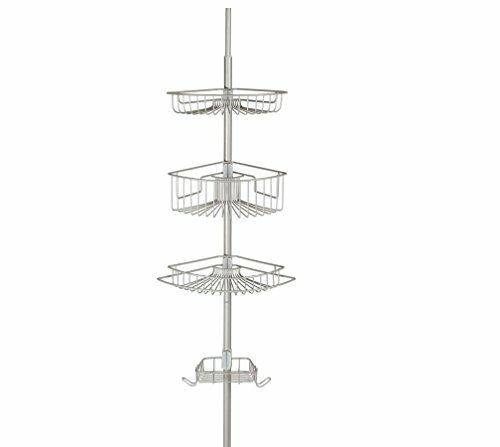 including three deep adjustable shelves for shower gels, facecloths, scrubbers, razors, etc. 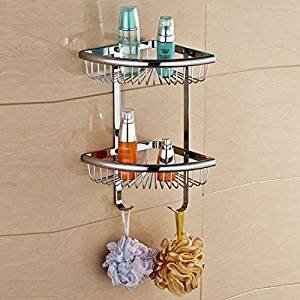 one soap dish, and two hooks so you can keep everyones favorites right there. Great idea for shared apartments, dorm rooms, and guest baths. 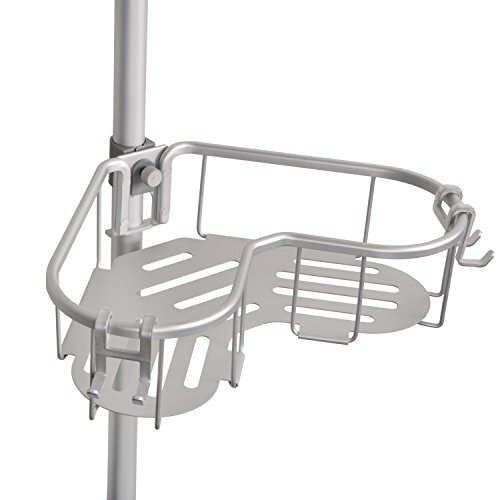 MAXIMIZE CORNER SPACE: Shower caddy utilizes wasted corner space – pole extends 5 to 9 feet. 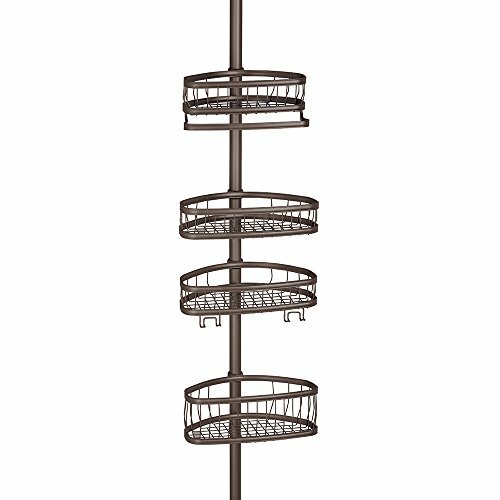 CONSTANT TENSION: New, patented constant tension technology – strong tension at any pole length. 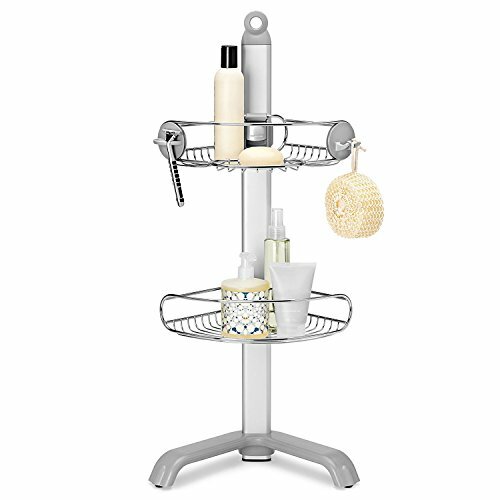 ROOM FOR EVERYTHING – 13.19″ by 10.43″ shower caddy has three shelves available for storing shampoo, conditioner, body wash, shower gel, shaving cream & more *NOTE: The shower caddy may or may not fit in a corner of a tub, depending on size and shape of the tub. Please check dimensions (13.19″ L x 10.43″ W x 28.15″ H) before purchasing. Adjustable shelves, corrosion-resistant and easy to clean. Sturdy tension pole,no tools assembly required, also you don’t need to drill any holes. Will not make any damage to your wall. Four large trays provide enough room for bath items and accessories, can hold all you need to use in shower. While the next situation can most probably happen to a girl, a woman or a numerous family, it can easily happen to any other person: after putting the bath products into a cabinet in your bathroom, the mirror on the wall, the sink, the toilet and the bathtub, you suddenly realize that there is no more room for your towels. How annoying is that, isn't it? But don't panic, because on foryourcorner.com you will find the solution right now! 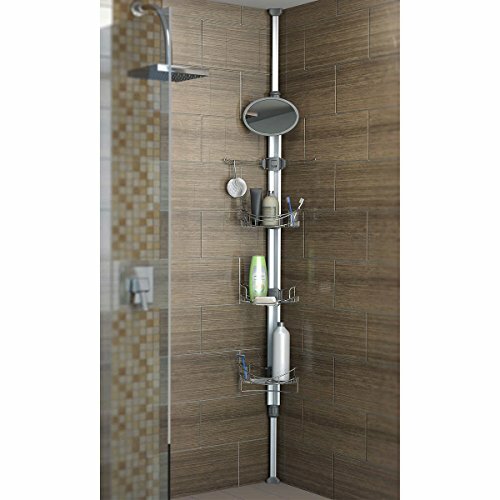 When you need some more storage space in your bathroom, the perfect, extremely simple and immediate solution to your problem is represented by the corner shower shelving technique, given by the variety of corner shower caddies that you can choose from! 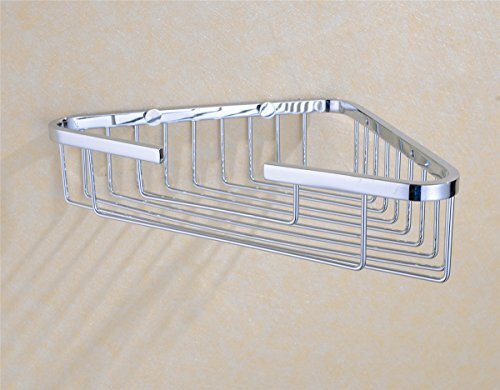 On our website, you will find some of the best shower caddies regarding not only design, but also quality. Resistant to moist, dust and wetness, made out of durable and premium-quality materials, corner shower caddies can be exactly what you need for your bathroom at this moment! 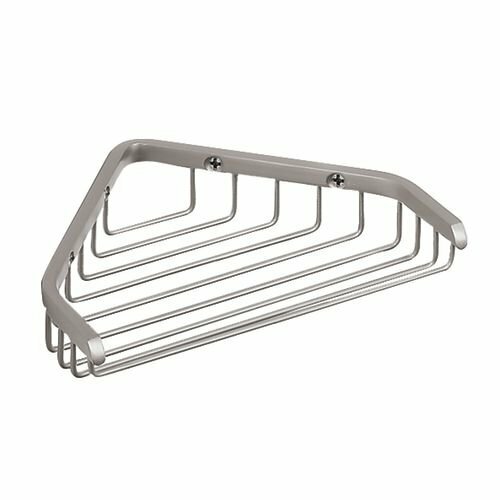 When preparing to put your shower caddy in your bathroom corner make note of the different ways your caddy can be installed. Is your bathroom wall smooth, or textured? Will you be using a caddy that needs anchor bolts for installation or suction? What kind of weight can your caddy take? What kind of weight can your wall take? What kind of weight can your installation method take. Consider all these things before your installation and it will help you to an amazing bath experience. 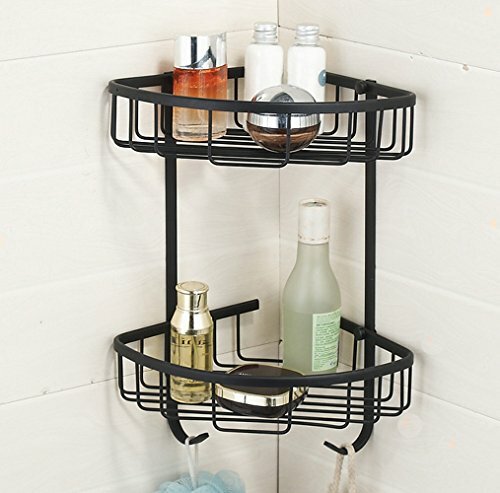 No more space on your walls for more shower shelves? Are you sure you haven't missed the walls? If used properly, for example with corner bath shelves, the corners of your bathroom can provide you more storage space than you could ever think! No more space on your floor? 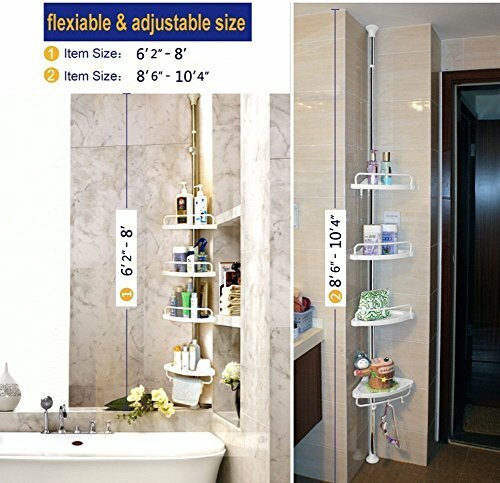 The corner shower shelves of a suspended shower caddy will fit in just perfect! With corner shower caddies, you don't have to worry for less space - it won't happen! Your bath will still look spacious, while your worries regarding storage will also fade away. 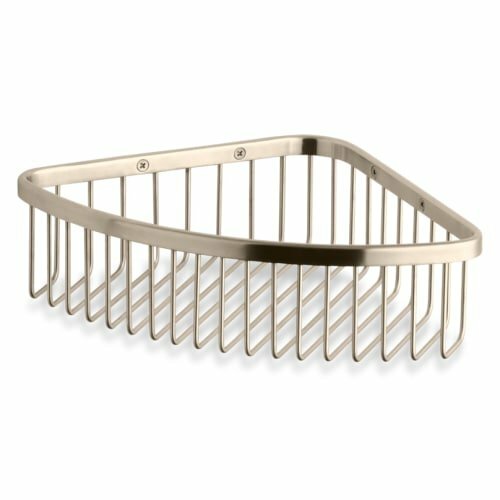 Moreover, corner shower caddies come in really cute and modern designs, from round shapes to heart shapes, from plastic to metal and from single-shelved to multiple-shelved structures. 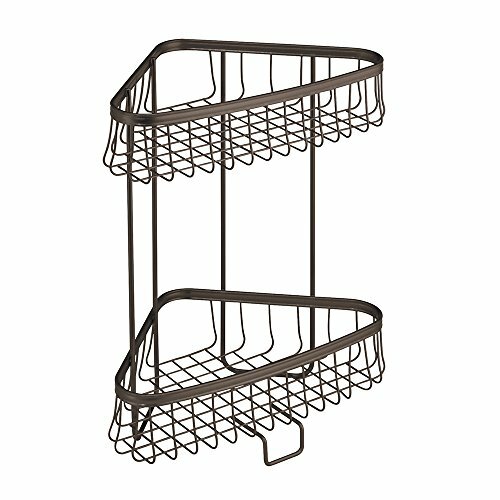 The appearances and styles of corner shower caddies are very different and pleasing for any bathroom architecture or theme. Take a look over our selection and choose the best fit for your own bath!